That’s not at all what I think, but lots of people do think that those City of London Big Things are indeed follies. 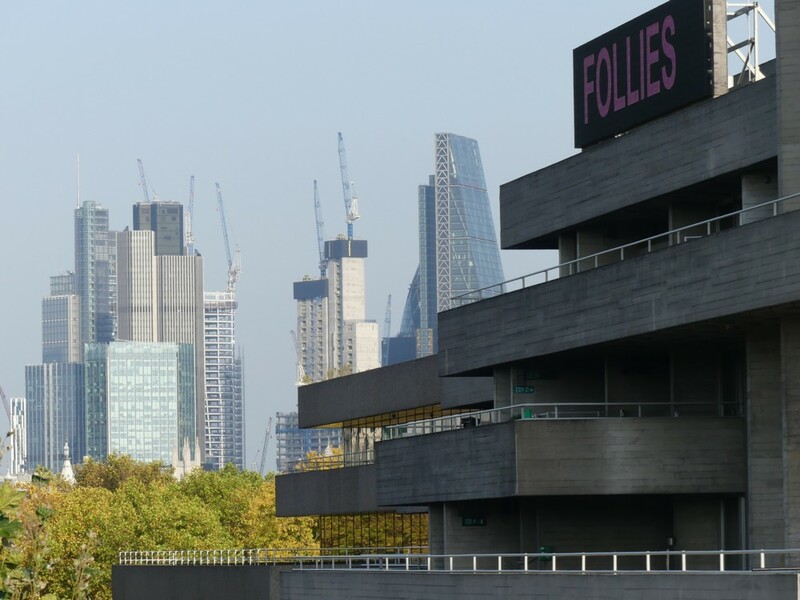 Follies being a show that the National Theatre, that concrete thing on the right, was advertising when I walked past it. There you go. Once you have a name like that, the gates of the Internet open. That being the picture at the top of a Londonist posting from last July. Based on the visuals, these projects are a mixed bag of ho-hum and coo-wow. Taken together, they make for a crowded cluster that’ll almost entirely obscure the much-loved Gherkin building, once so dominant on the skyline. A particularly coo-wow part of the story being the Scalpel. See above. 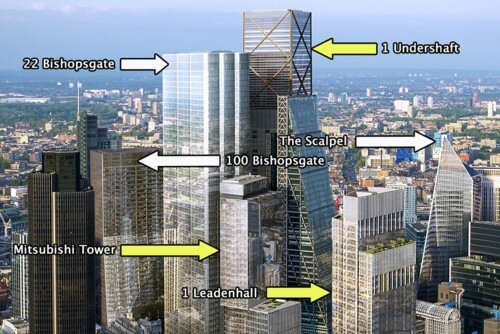 The rather ungainly 22 Bishopsgate, which is going up where the Helter Skelter would have gone until the financing for it collapsed, is going to be the tallest Big Thing in London, for a short while, just until that big boxy tower ("1 Undershaft") with the diagonals on it goes even higher. 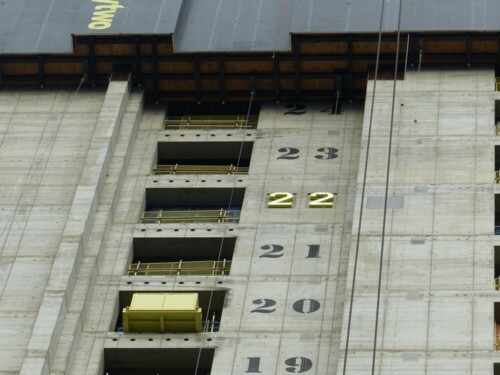 At the top of the building will be a double-height public viewing gallery, which will have dedicated lifts, be free to the public and sit alongside a two-storey public restaurant and bar. I can’t wait, as people say when they’re just going to have to wait and are actually quite capable of waiting, in a state of impeccable mental equanimity. This is the kind of building of which it will be said: The view from 22 Bishopsgate is magnificent. 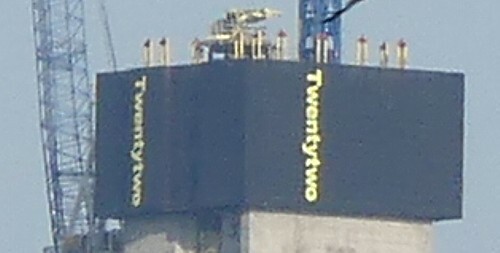 From 22 Bishopsgate, you will not see 22 Bishopsgate. They used to say this about the National Theatre. I sseem to recall taking some closer-up photos of all this activity a few months back. I must take another look at those. And … I just did. June 3rd, earlier this year.